Cold North Atlantic seaweed with added nutrients! 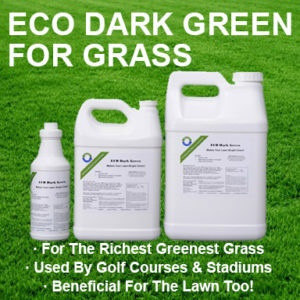 Eco Super Seaweed For Gardens & Lawns is the goodness from seaweed extracted to form a concentrated seaweed liquid. Increasing fruit size, color, brightness and taste! Lateral branch growth in trees! Increasing crop tolerance to stressful conditions! Increasing root development of plants and trees! 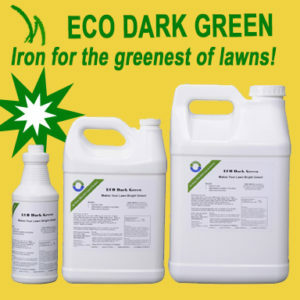 Eco Super Seaweed For Gardens & Lawns makes for a highly efficient base for the nutrition of a wide variety of plants. And it can be safely mixed with many commonly used sources of nitrogen, phosphate and pottassium, along with supplements like iron. 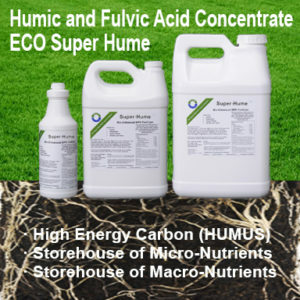 Eco Super Seaweed For Gardens & Lawns stimulates the soil bacteria which, in turn, helps to release much of the nutrient content. 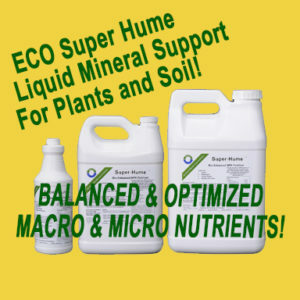 In many cases these nutrients are fixed in the soil and not available to plants. Whether you’re feeding grass, tomatoes, vegetables or flowers, Eco Super Seaweed combats this, helping you to make the most of applied nutrients and even reducing the quantity required for healthy growth. To an already superb product we add organic carbon, vitamins, enzymes, and molasses. 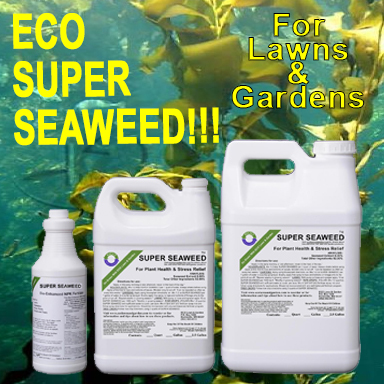 Eco Super Seaweed is also valuable in helping to break down organic matter. This is a particular benefit when treating turf, where thatch can be a serious problem if not managed properly. Our seaweed formula contains the most studied type of seaweed, ASCOPHYLLUM NODOSUM. Which has been researched to provide growth regulators and growth promoters. Our SUPER SEAWEED formula contains Cytokinins, Indoles, Hormones, Auxins and Gibberellins. Commercial purchase: Quarts are available in cases of 12. Other case sizes ship palletized or products can be shipped bulk in 55 / 250 / 275 / 1000 / and 4500 gal. containers. Contact Us for pricing and availability. Row Crops: (FOLIAR) Mix 1-2 quart(s). 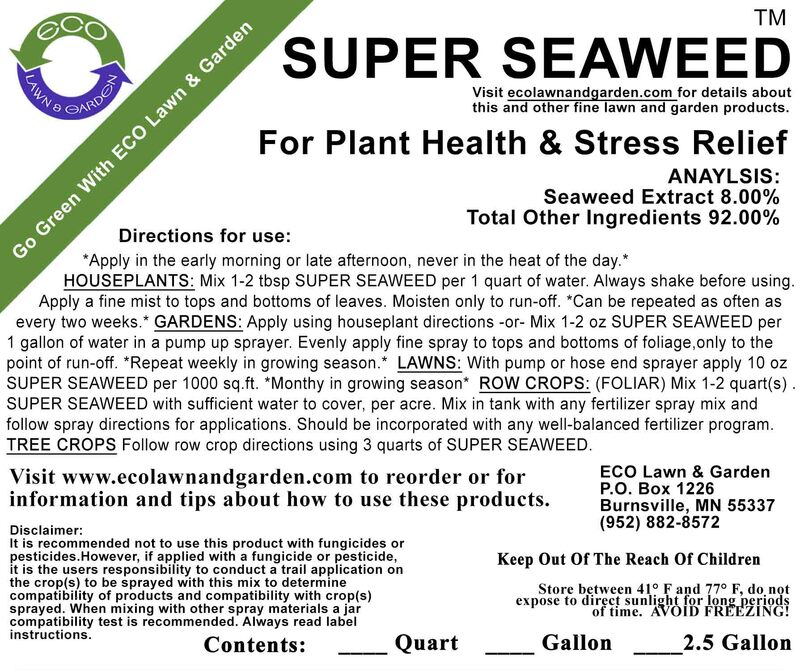 SUPER SEAWEED with sufficient water to cover, per acre. 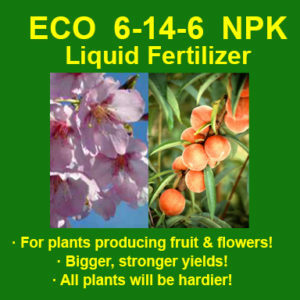 Mix in tank with any fertilizer spray mix and follow spray directions for applications. Should be incorporated with any well-balanced fertilizer program. Tree Crops: Follow row crop directions using 3 quarts of SUPER SEAWEED. Note: To ensure compatibility with foreign products, a jar compatibility test is recommended. Always fill tank with water first, then add product while tank is circulating. NEVER MIX CONCENTRATES DIRECTLY TOGETHER. Throughout history Seaweed has been used in growing crops. It contains literally every nutrient known to Man. Our SUPER SEAWEED is cold water North Atlantic Ocean variety and not fresh water lake type, thus providing for maximum nutrition. There are many types of Seaweed on the market. Not all are equal. University Study has proven that the best source of Seaweed comes from the clean cold waters of the North Atlantic. The reason for this is because the Ascophyllum Nodosum variety is found there. It only grows in cold water locking in the nutrients. Ascophyllum Nodosum is recognized as an excellent Natural fertilizer and source for organic matter. 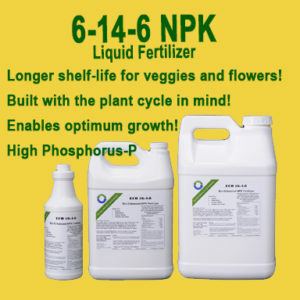 Research on plant growth conducted over the last two decades has demonstrated that the plants assimilate essential micro-nutrients more readily when they are applied directly as a foliar feed than when applied through the soil in an Organic form. Our seaweed formula contains the most studied type of seaweed, ASCOPHYLLUM NODOSUM. Which has been researched to provide growth regulators and growth promoters. Our SUPER SEAWEED formula contains Cytokinins, Indoles, Hormones, Auxins and Gibberellins. It is acceptable by the OCIA standards as “organic” Naturally high in potassium, our SUPER SEAWEED supplies a wide range of carbohydrates including mannitol and organic acids. Mannitol is a natural chelating agent, which can release unavailable trace elements already in the soil, for root uptake. Cytokinins – are cell division factors, which rapidly divides cells. Indoles – are naturally occurring plant growth promoters for root development and bud initiation. Auxins – promote rooting and cell enlargement. Our SUPER SEAWEED liquid formula contains a wide variety of micro-nutrients plus Riboflavin, Niacin, Choline, Beta Carotene, Pantothenic Acid, Folic Acid, Folinic Acid, and Alginic Acid. 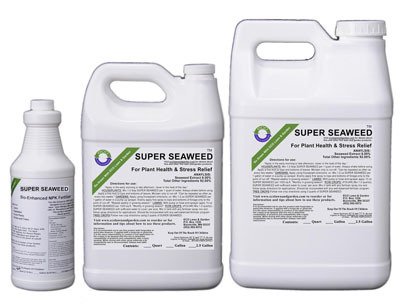 SUPER SEAWEED is a foliar applied product compatible with most other fertilizer solutions, though a compatibility test is always recommended. Derived From: North Atlantic Ascophyllum Nodosum Seaweed. Also contains Cytokinins, Indoles, Hormones, Auxins and Gibberellins. 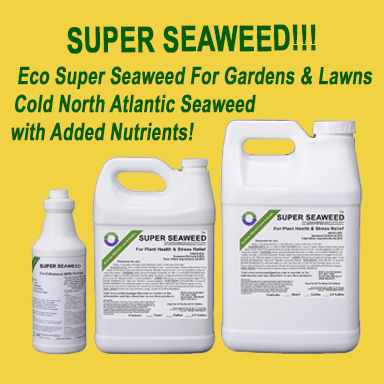 SUPER SEAWEED liquid is also available in 5 gal, 30 gal, 55 gal, 275 gal, containers. Please contact us if you have any questions.